This is a day that lives in Infamy . . . especially in Hawaiʻi (HERE).
. . . and not because of the crappy Affleck movie, although that would certainly qualify. Actually, truthfully, I didn’t watch the movie. Hollywood is not good with accurately depicting historical events. Look what they did with Titanic and The Day The Earth Stood Still (either version) and so, I gave it a pass. Today is also when I link the second post showing the Topaz Simplify 4 processes (HERE). I think this will be the last classic car detail photo for a bit. I’ll see if I can find other interesting photos to showcase here. Few people will remember Tivo (I think they are still in business) . . . and the promise of interactive, voice-activated playback. When program content will be all digital and produced with virtual actors by powerful and superfast AIs, viewers will be able to pick in real time what they want the figures on the screen to say and do. It’s a technology primed for abuse . . . I can’t wait to direct a number of (virtual) personalities to punch themselves in the face. Well, you knew this was coming . . . Escher Rose Petals and Life Savers Spinner at Night. My vote for least historically accurate film is ‘Braveheart’. Utter Tosh! Personally, I think the three Star War prequel rank way up there. Also, many of the Marvel movies are completely inaccurate accounts of superheroes and their interactions with modernity. ‘The Battle of the Bulge’ is seriously inaccurate but I would also nominate another Mel Gibson (seriously anti Brit) film, ‘The Patriot’, such a load of old tosh! The bad guy in The Patriot was Hessian, no? I suppose next you’ll tell me you don’t like Quigley Down Under because of the comment made when he’s riding the wagon. I like any film with Alan Rickman. Mel Gibson is an Anglophobe and I don’t like him for that! Yes, Gibson is something else. Then again, it’s not like he makes up things whole cloth. Seriously, though, do you think those movies negatively affected the average American’s views of British people? I’m not speaking about the extremes, but of the population at large. I don’t have the numbers but my impression is that, on average, British people are more critical of pretty much everything American that the other way around. Our food, our language, our movies, our TV shows . . . incredibly, they are most critical of our sense of humor, or, as they say, lack thereof (as if). I often feel as if I’m mounting a solitary counteroffensive since at every turn fellow Americans espouse the (dubious) virtues of everything British. Gibson is Australian and he hates the Brits. We criticise your language out of ignorance. We imagine you should speak English English but fail to understand other European influences. Your food is good but our breakfasts are better. I love McDonalds. Your movies are great but we don’t understand some of your TV sitcoms. Why are US movies so funny but TV shows not? Sense of humour, you can’t even spell it properly… Only joking. Actually, I do think that films like Braveheart have an influence on perception of the Brits. Seriously, I’ve never met anyone who disliked England, English people, or English culture, and I’ve met a lot of people. I’ve heard some criticism of their somewhat elitist attitude, but that’s as far as it went. I can’t know for sure, but the percentage of a population that can be swayed by movies is fairly small. Typically, for almost anything one watches or reads, the majority of the people who are “swayed” already had a leaning toward those beliefs. Not saying it can’t happen (propaganda by governments) but saying that Mel Gibson helped spark or contributed to the spread of anglophobia here in the US seems a fairly tall claim. I guess I’d have to see the numbers. I’ve linked to one comment, but you can read the previous and following comments for the pros and cons as to whether various movies are specifically Anglophobic. I knew a man (Now I’m thinking of the Mr. BoJangles song! Ha! )…anyway…I knew a man eons ago who was a Pearl Harbor survivor. He was such a sweet man. We became good friends…even tho’ he was old and I was young(er) (than I am today! HA!). I sat by his bedside when he was dying. I should blog about him someday. PHOTO: Cool logo, “texture” and shine! I’ve really enjoyed the classic car detail photos! CARTOON: HA! The cartoon is funny…but what you said made me laugh, too. DOODLE: OOH! I like all of the doodles in the dark/night the bestest! Yup; you should blog about him. Thank you, Carolyn. As for the photos, I’ll hopefully switch to something people will like as much (or as little, depending on the person). As for the cartoon and my comment . . . that day is coming, and I am looking forward to it . . . more and more every day. The dark background makes them stand out more and seem more vivid than with the white background. I should probably play with different colors to see how the background affects the mood and look of the various things I put up. 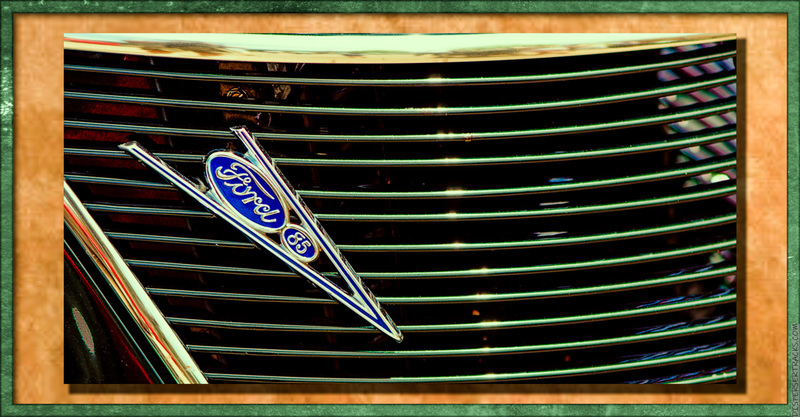 That Ford logo is beautifully angled to provide good contrast with those horizontal lines . . . resulting in a great composition and color harmony. Nice!